Granada is a beautiful city in so many ways. It is small enough to be able to walk around with relative ease (the hills will keep you fit! ), it is crammed with historic buildings, grand civic and religious architecture, echoes of its Moorish and Jewish heritage. We used to marvel at the history in London, but so much of what remains in London is from the Georgian, Victorian and Edwardian eras, and there are scant physical reminders of a medieval past. 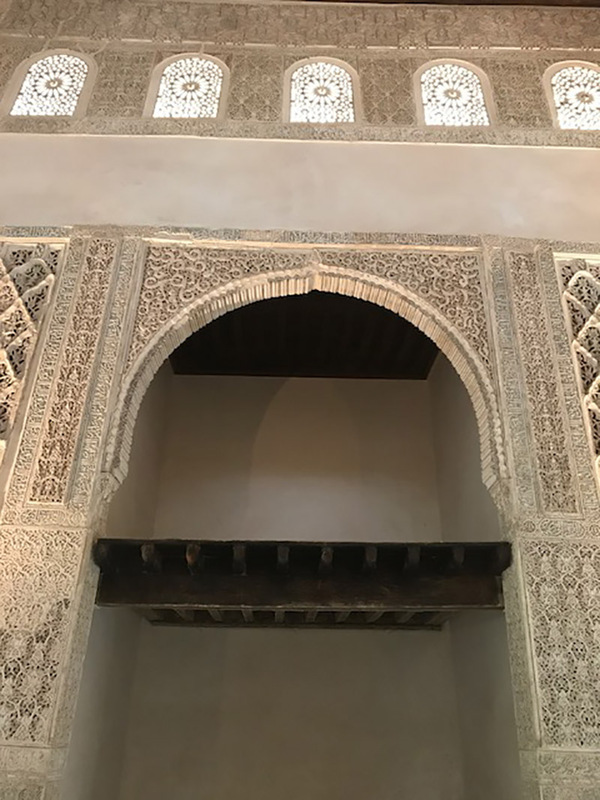 In Granada, however, starting with the beautifully preserved Alhambra Palace, many of these buildings go back many hundreds of years, with buildings dating from 13th Century; some from the 11th Century. 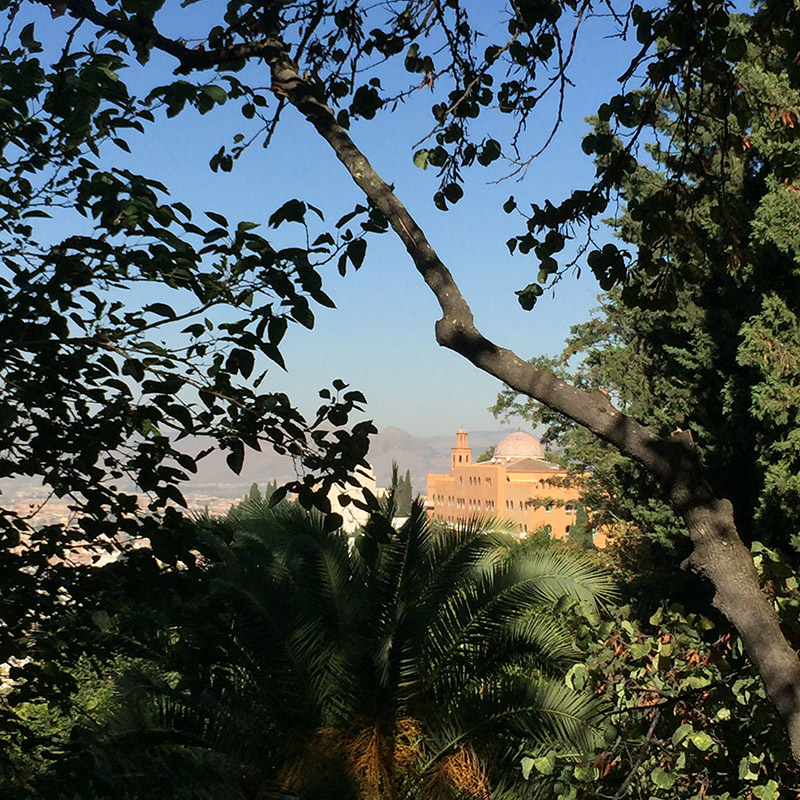 This is a city that is not just about the Alhambra, magnificent as that complex sprawl of buildings is. 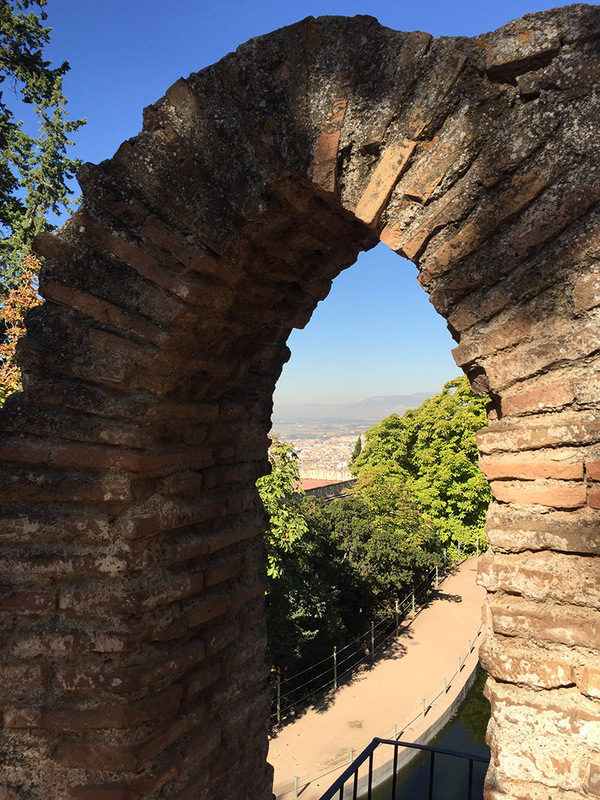 Granada is a city that deserves to be explored, and as we have been based here this month, we have taken advantage of the fact that we tend to go everywhere on foot, so have the time to delve a little deeper. Our walks have opened up some beautiful new discoveries, and I am sure there are many more yet to find. 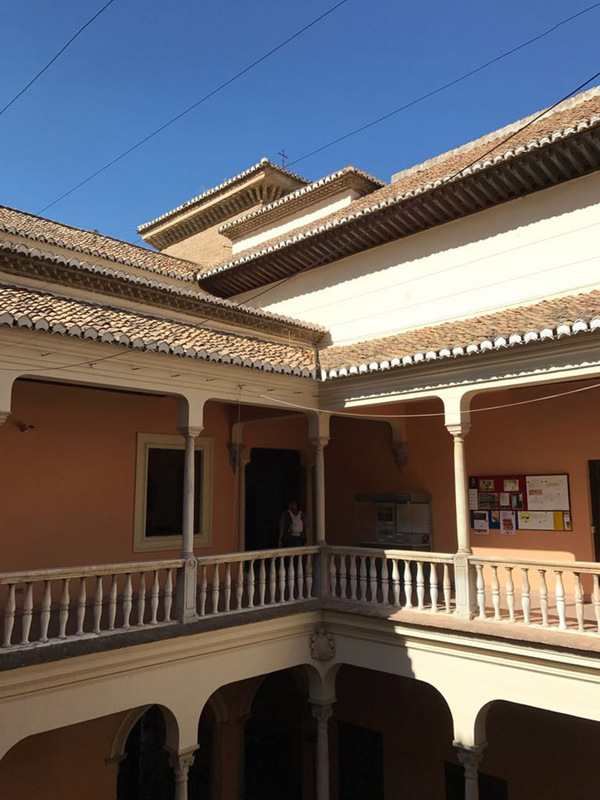 The ancient domestic architecture of these Moorish cities - Granada, Córdoba and Sevilla - centres around the patio, a central courtyard surrounded by cloisters and open to the elements. As a result, these outdoor areas feature large, but it has been the gardens attached to some of the smaller palaces and carmens that have been something of a revelation. 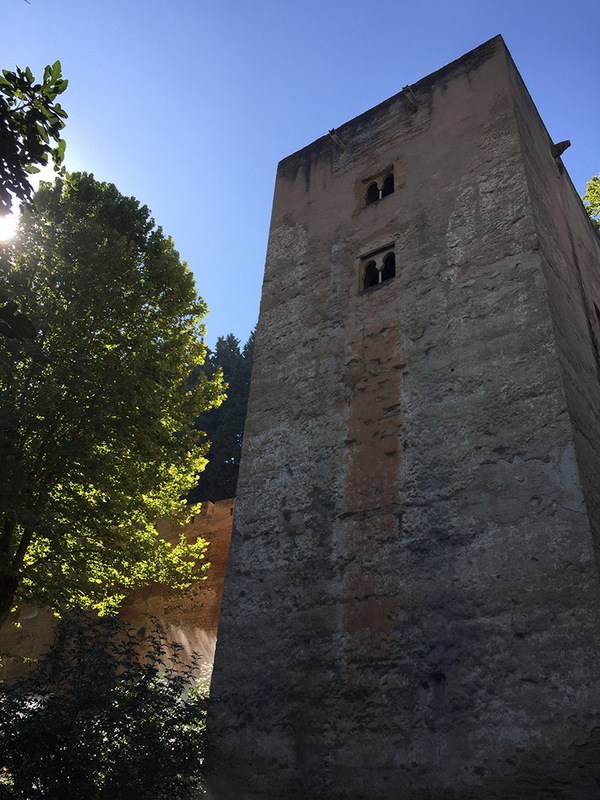 We have often read about the Carmen de los Martires and, last weekend, we decided to take a walk up the hill towards the Alhambra to take a look. This is a corner of Granada that many visitors would probably never know existed. 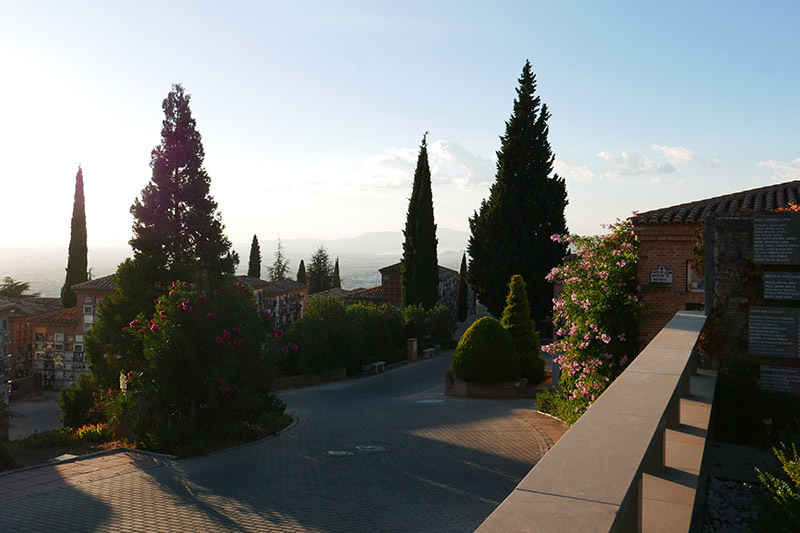 To one side of the Alhambra complex, and tucked behind the Auditorio de Manuel de Falla, this is a veritable paradise. Discreet wrought iron gates are the only indication that something lies beyond. Walk inside the gates, and a glorious park opens up before you, but only by layers - you walk, and a new layer reveals itself to you. Turn right as you enter the gates, saunter past a grotto with water trickling through lush foliage that frames a statue, and enter a formal, Italianate terrace that leads to the house. The existing building was created in the 19th Century and has elements of English Classical, Italian and French styles. However, a building has stood on this site for many centuries preceding the current incarnation. 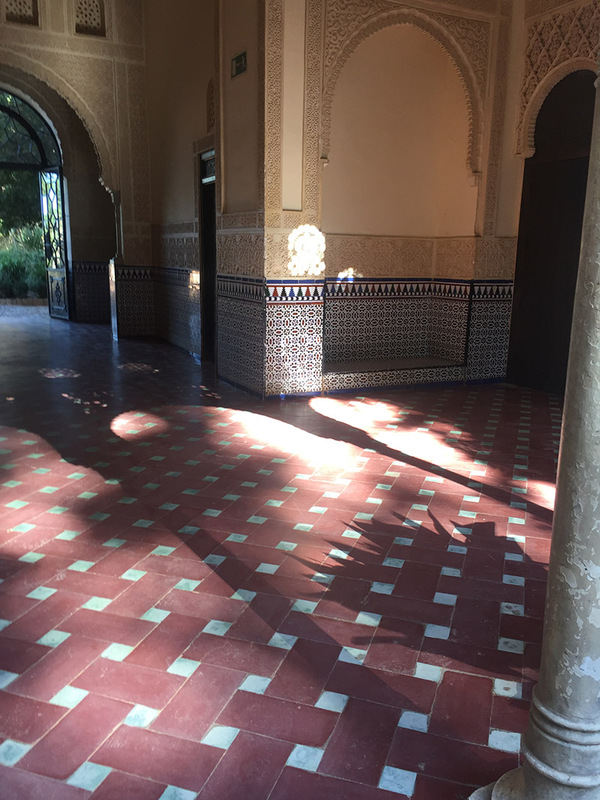 A gate to one side of the stuccoed building reveals the first delight: a delicious Moorish-style patio with richly carved walls and arches, and where sunlight filters through lacey upper windows casting a soft, magical light on the marble floors. Water plays a major part in this garden, and the gentle sounds complement the shadows and golden highlights. 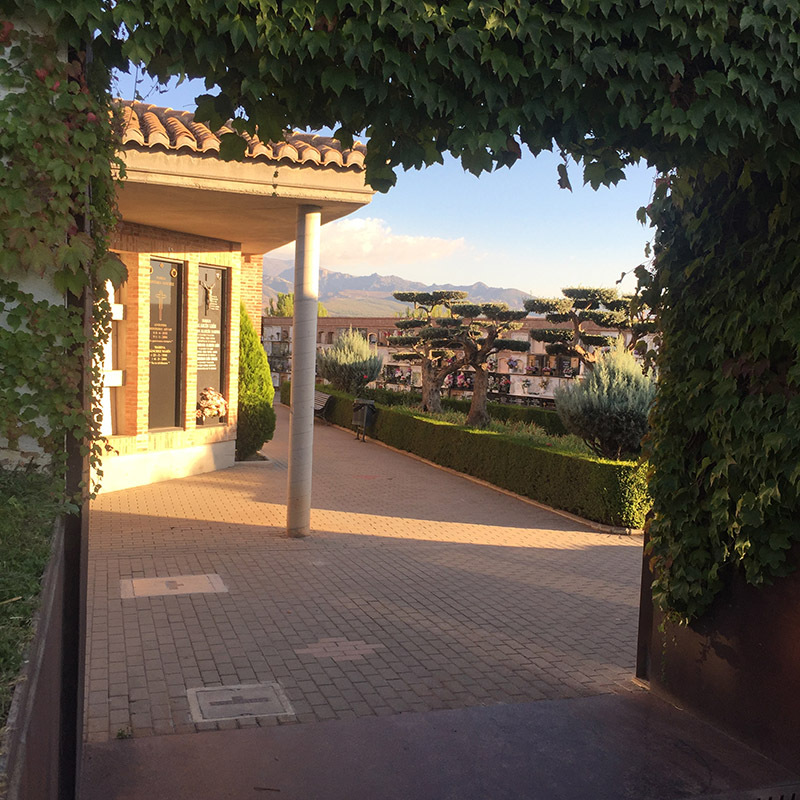 Leaving this patio, another cloister opens onto another terrace from where stairs lead down to a beautiful, formal garden compete with fountains, soaring palm trees and stunning views over Granada. Immediately, you feel divorced from the city itself, and find yourself in an almost Tolkienesque evocation of a fairy kingdom. Leave this sunken terrace and a whole park opens up before you. Paths meander between trees, through vine-clad archways, past fountains. 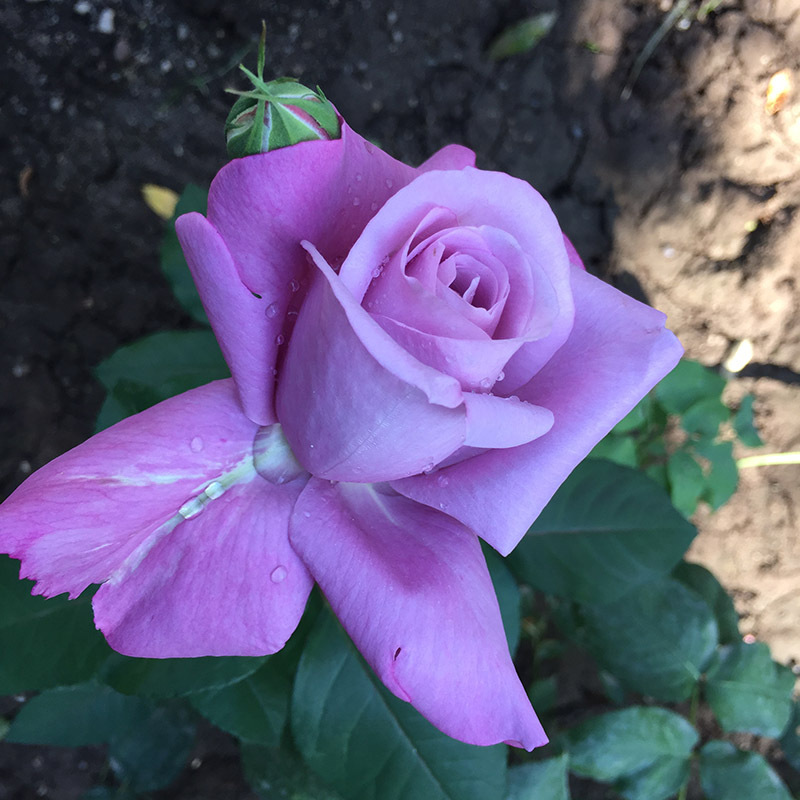 In one corner, there is a delightful rose garden with water-lily-filled pond. Despite being above a city, the only sounds you can hear is bird song. The canopy provided by the enormous mature trees shields you from the heat of the sun, and the sun was still warm even on this early October day. Entry to this beautiful small park is free, and I can imagine that many visitors to Granada would not even be aware of its existence. 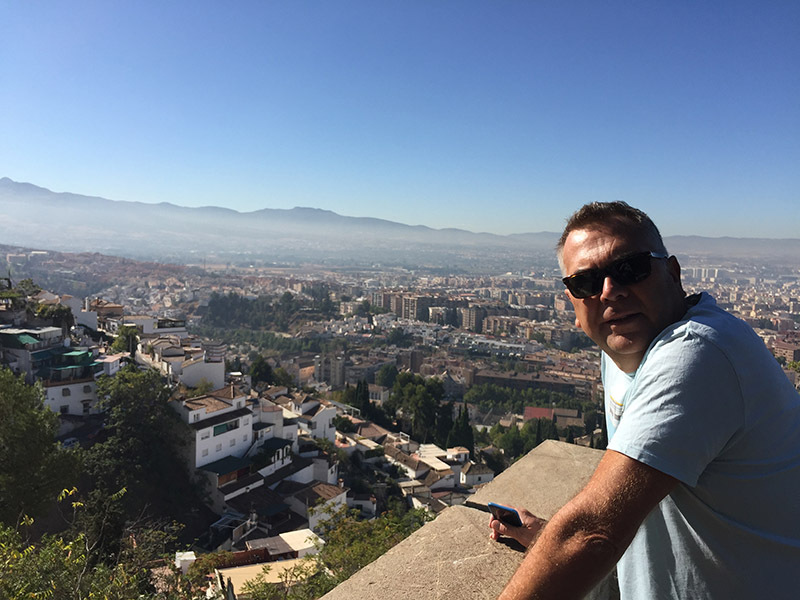 From here, we walked around the perimeter walls of the Alhambra and back down into Granada City Centre beneath Sacromonte. 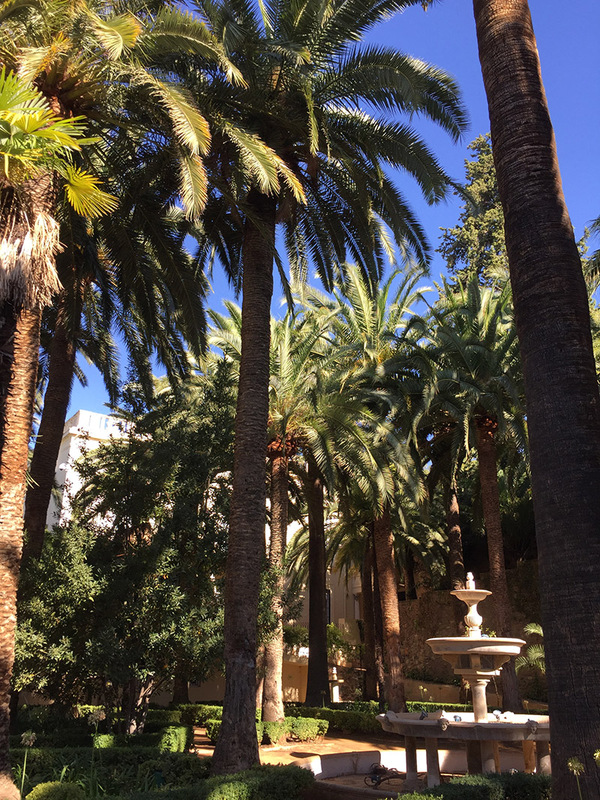 We’d also suggest a coffee at the little cafe that sits on a terrace just beneath the Auditorio de Manuel de Falla before you venture into the gardens at the Carmen de los Martires. This building and its garden is now owned by the Ayuntamiento, and the original palace was constructed here between 1530 and 1592. The palace is now the home of the Civic Archive, and it is free to wander through to cobbled courtyard and venture into the delightful central patio at the heart of the building. On our visit, there was an exhibition of photos, drawings and historic maps tracing Granada’s development back over the centuries. Andrew and I love maps, old prints and photos, so this proved fascinating and in a corner of one of the display cabinets there was a sign stating that copies of the maps could be purchased! We identified an archivist by his white lab coat, made the necessary enquiry and were taken to a glorious room on the first floor gallery above the patio. This timber ceilinged, hugely impressive room was as hushed as the most revered of libraries, and a few researchers sat facing computer screens. We were attended to by no less than 4 members of the archive team, as if we were taking delivery of a priceless artefact. White cotton gloves covered hands, and we were politely asked to remain by the door and venture no further. The 7 prints of these historic maps cost a mere 18€. The past week, Andrew started back at Escuela Delengua for more Spanish lessons (I am green with envy and woe betide him if he starts to speak better Spanish than me!). After one of his classes, he joined a student trip to the Realejo quarter of Granada - the old Jewish part of the city. Here, he was taken to another secret garden and we revisited this on Friday morning. The Cuarto Real de Santo Domingo is a site of special Historic and Cultural Interest. At the centre of what now remains is a stunning part of a former Nazrid Palace built during the reign of Muhammed II (1273 - 1302). 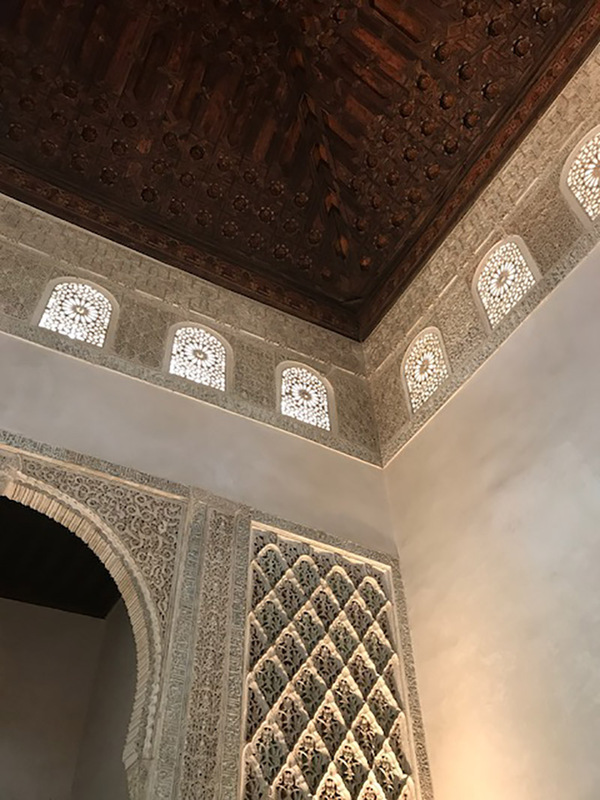 The room that remains is a beautifully preserved qubba, or Reception Hall, with examples of ceramic tiling and intricate carved stonework to rival that to be found so extensively in the Alhambra itself. 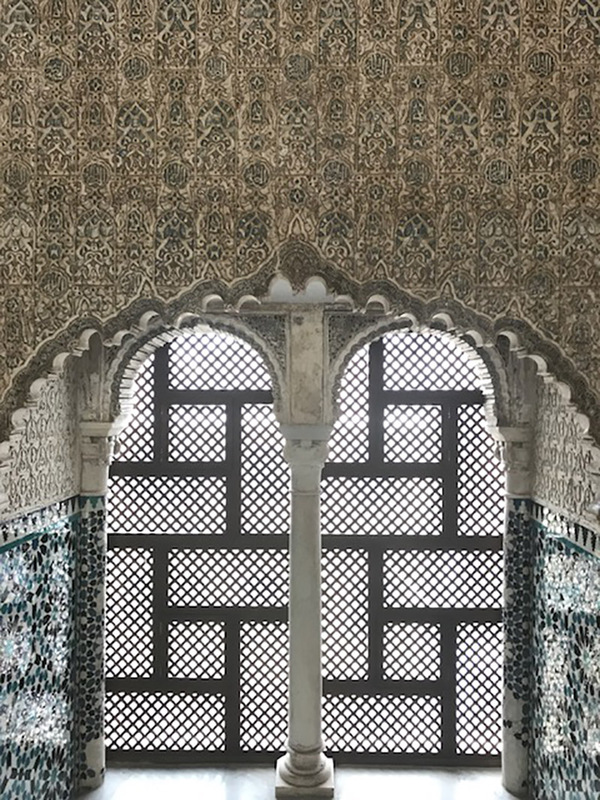 In fact, much of the work here predates that of the Alhambra. 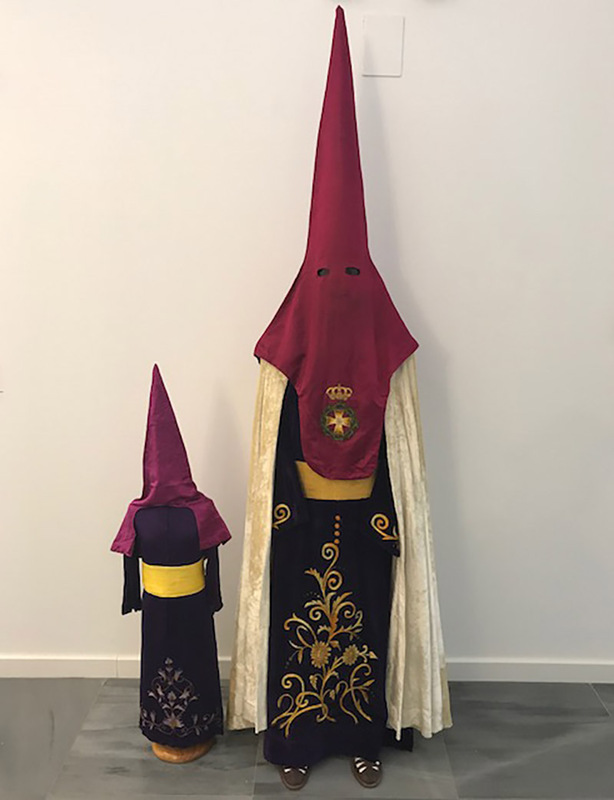 Today, this astonishing example of Moorish architecture forms part of a recently built, and very sympathetic exhibition hall and when we visited there was an exhibition entitled “La Tunicá Sagrada” featuring the sumptuous sacred robes that adorn the various effigies of Christ for religious processions, some of which date back 300 years. The richness of the fabrics, gold embroidery and lacework is incredible. Again, entry to see both the Qubba and exhibition was free. Outside, the exhibition hall, there is the garden, a work in progress, but yet another oasis where formal design, trees and water work together to create a cool, calming disconnect from the hectic blur of the city. AW: Finally, I would like to add another small but stunning garden I visited last week. At the far end of the Cementario de San José (The cemetery is WELL worth a visit in its own right, see our blog post from last year) you will find the Jardin de Palicio de los Alixares. Landscaped over the site of the ruins of the Palacio. It's central water feature gently trickling is the only sound you will hear. 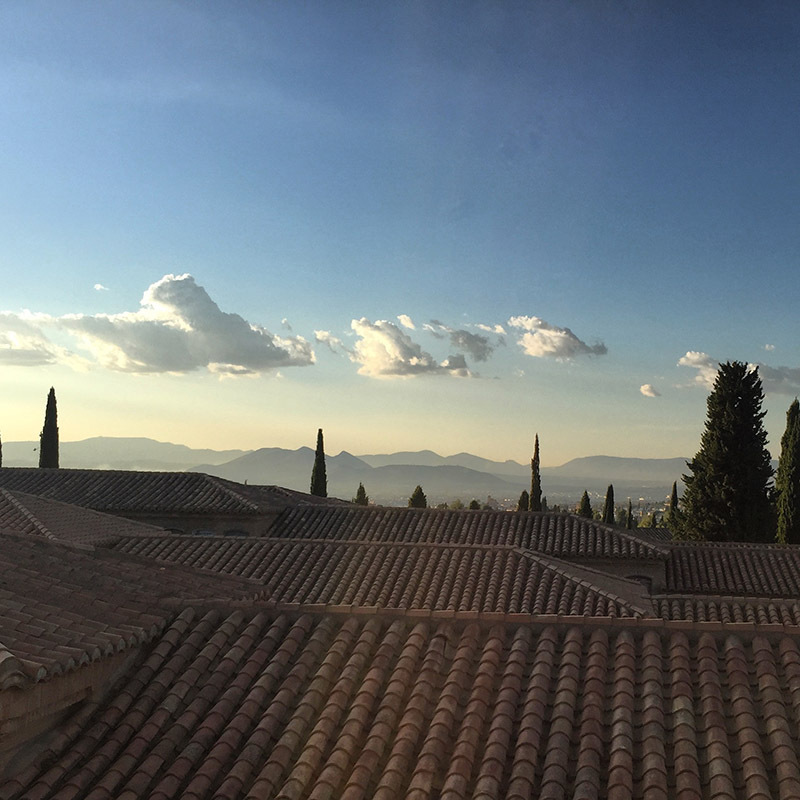 The vista towards the Sierra Nevada is stunning. A place to sit and clear your head. I visited just as the sun was setting I didn't see another person and it was an incredibly moving place to be. 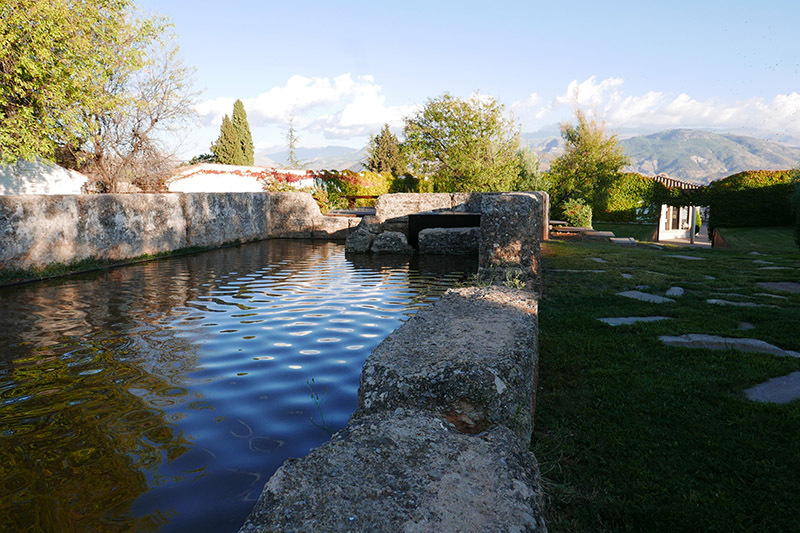 Gardens abound everywhere in Granada, some hidden away behind the walls of the private Carmens spread across the Realejo and the Albaicin. 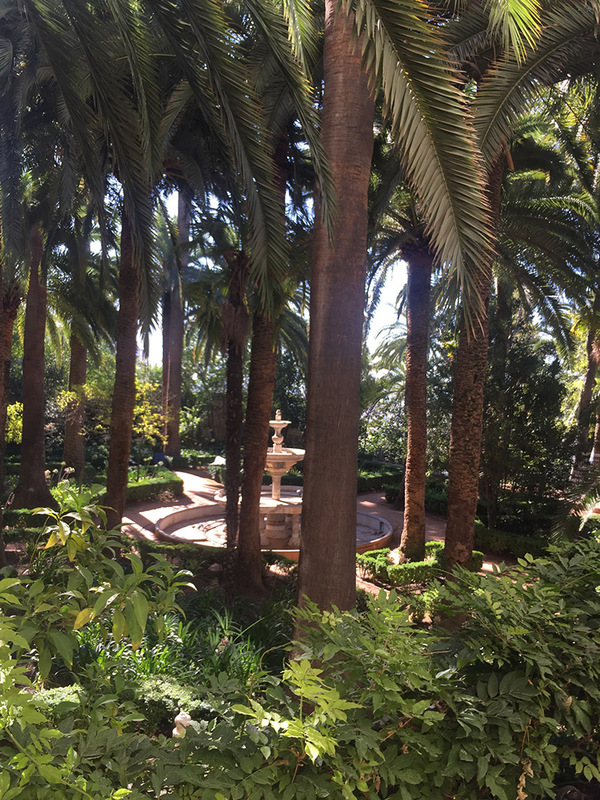 But wandering through the narrower streets you come across charming little courtyards such as the pretty garden attached to Manuel de Falla’s House or, indeed, the garden leading up to the Auditorio de Manuel de Falla. 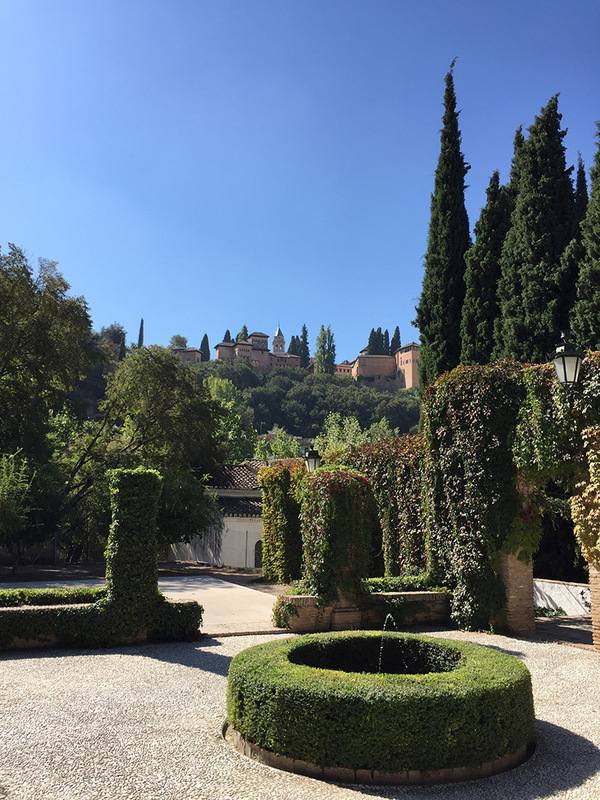 There are gardens and courtyards in many the University Faculty buildings in the centre of Granada, and these are well worth a look, particularly the Jardín Botánico de la Universidad de Granada accessible via the Law Faculty or through the grand iron gates when these are open. 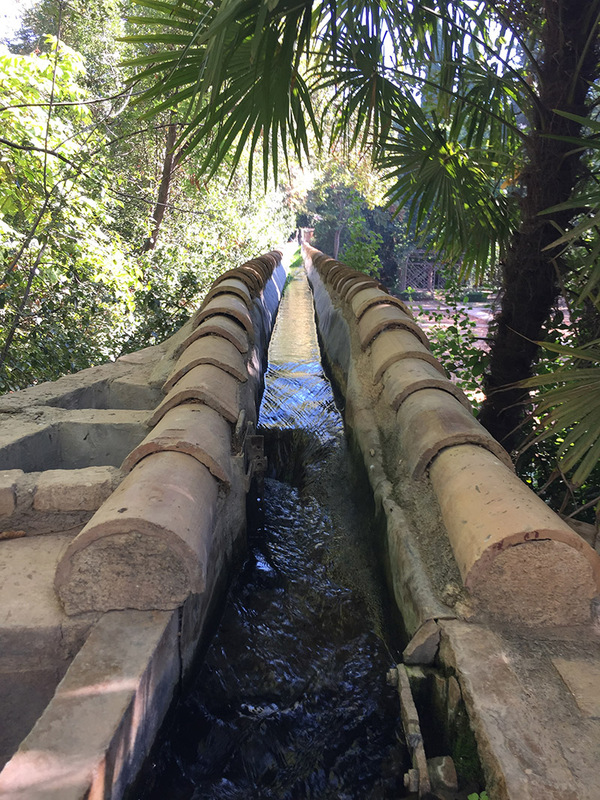 The larger gardens and parks, such as Los Jardines del Triunfo, the Fuente Nueva park that forms part of the University’s Fuente Nueva campus and the Parque Garcia Lorca are all worth exploring.